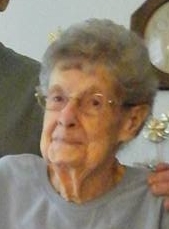 Betty E. Davis, 95, passed away on Saturday, January 19, 2019 in Sterling Care at Frostburg Village. Born on November 17, 1923, in Eckhart, she was the daughter of the late William R. and Mae (Brode) Pape. In addition to her parents, she was preceded in death by her husband, John H. Davis, Sr; son, Richard “Doc” Davis; brothers, Richard and Carl Pape; sisters, Mildred Brinkman, Delores Smith and JoAnn Pape. Betty was retired from Sacred Heart Hospital where she worked in the pharmacy. She had a fondness for crocheting and crafts and loved her butterflies. Mrs. Davis was a member of Salem United Church of Christ in Frostburg. Surviving are son, John Davis and wife Linda; daughters, Susan Sahm and husband, Jack and Connie Via; 19 grandchildren, step grandchildren and great-grandchildren; sisters, Jenny Boch and Patricia Speir. Family and friends will be received at Durst Funeral Home, 57 Frost Ave, Frostburg, MD, on Wednesday, January 23, 2019 from 1-3 pm with a funeral service at 3 pm with Rev. Diane Smith officiating.